A soldier is guarding his position. Only a steel helmet shields his head from enemy fire. He has an SCR-536, commonly known as a Walkie Talkie, attached to his body by a sling. The Signal Corps radioman carries a 35 lb. SCR-300 Backpack mounted radio set to monitor airwaves for incoming transmissions. A soldier pushes his way through a lush jungle or a barren desert. Next generation body armor protects his vital organs. Helmets and backpacks are covered with wafer thin electronically steerable antennas which provide the war-fighter with ‘always on’ Broadband communications. He deploys a golf ball-sized drone, from the palm of his hand, which leads the way and sends him back full audio and video, up to a mile ahead, allowing the soldier to survey any possible threat that may be lurking. Protecting the men and women on the ground in harm’s way, via stronger physical shields, more precise weaponry, and highly advanced ammunition, has always been an essential objective in modern warfare. In like manner, huge advancements are taking place in terms of how military personnel stay in touch with the world both inside, and outside, their zones of carnage. Historically speaking (according to Wiki), a position that is ‘under siege’ is one that is under attack, and has lost the ability to transport supplies or personnel — and thus unable to communicate with the outside world. Though the connection between physical transport and message delivery, in terms of military communications, declined over the course of many centuries, what remains crucial is the vital importance of reliable broadcasting to any mission. The future solider may be alone, or in a small group; and yet, he or she will never be more connected to his or her homeland, and to the platoon members, as a result of massive strides in the development of military communications technology. C-COM Satellite Systems continues to make important improvements to its product line for the benefit of soldiers engaged in modern warfare, surveillance, and national defence. 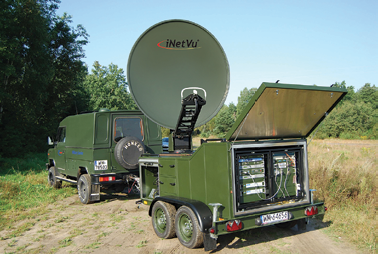 The company is a pioneer in the design and manufacture of fully auto-deployed antenna systems (iNetVu®). Users need only arrive at the scene where terrestrial infrastructure is compromised, limited, or non-existent, push one button on the iNetVu® 7000 series controller, and the antenna will automatically connect to satellite in less than one minute, allowing for the transmission and reception of broadband internet. End users of C-COM product includes militaries from Canada, USA, France, UK, Denmark, Russia, China, Kenya, and many others. The company has sold more than 8,000 units into 100+ countries around the world and has worked through its vast reseller network to sell its solution to numerous global governments. Militaries need options as to how they will deploy their crucial communications solutions. Tanks, trucks and other specialized vehicles require a properly mounted and integrated antenna system that meets their required specification. If portability is necessary, a lightweight, highly robust system is required. When budgets are tight, and certain military specifications are not of critical importance, more and more governments are able to use a Commercial-Off-The-Shelf (COTS) form of antenna that performs an identical function as a mil-spec product... but with a lower price tag. C-COM offers a multitude of solutions to global governments and militaries for their SATCOM requirements. Vehicle mounted antennas (iNetVu® Driveaways) are installed on to the roof of most any kind of car, truck or trailer. Transportable antennas (iNetVu® Flyaways) are multi-case products that can be assembled by one person in less than 10 minutes without any tools. Backpack antennas (iNetVu® Manpacks) are lightweight, single case, highly portable systems that are available in manual point, or auto-acquire. All of these products can be used on the battlefield in a Comms-on-the-Pause (COTP) environment. As a result of their single case form factor, the iNetVu Manpacks are likely to be of key value to soldiers in the field. Available in three sizes (MP-60 cm., MP-80 cm. (upper left image: top, antenna stowed, bottom, antenna deployed, MP-100 cm.) and in three different bands (Ku-, Ka-, X)-, the latest generation of antenna system is more compact, more powerful, and easier to use, than any product C-COM has previously designed. 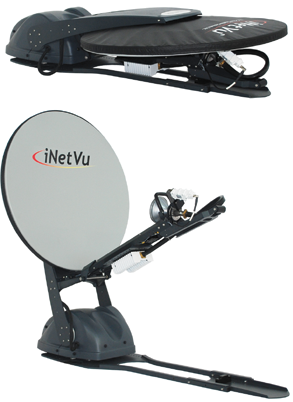 With the latest on-board antenna controller technology (iNetVu® 8000 series), the MP-Series can be carried by one individual who can unpack, deploy and acquire a satellite in under 10 minutes. The durable carbon-fiber reflector comes in identical and easily replaceable multi-segments. 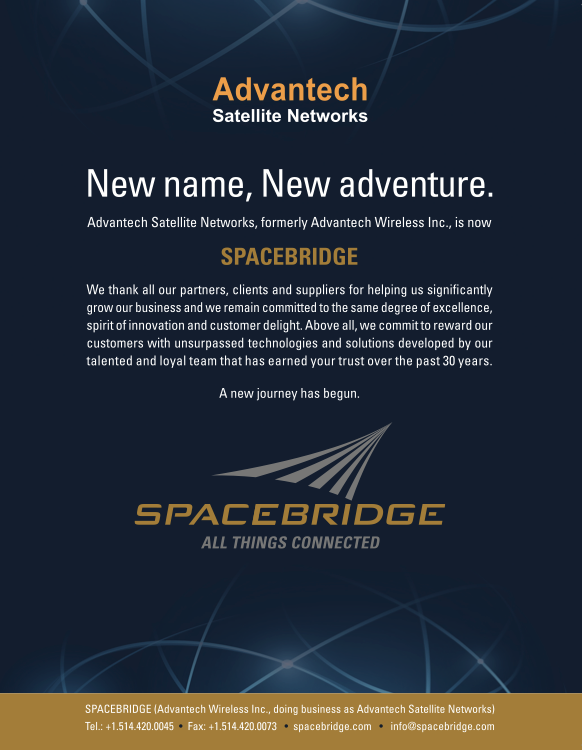 Emergency responders, disaster managers and other critical personnel can easily bring broadband connectivity via satellite to an area that is completely devoid of terrestrial communications. Looking toward the future, C-COM is engaged in high level research and development of a unique Comms-on-the-Move (COTM) antenna solution — one that will maintain connection to satellite, even while the vehicle, or soldier, is in motion. The not-too-distant-future soldier will have access to a highly modular, conformal, electronically steerable, flat panel, multi-beam, self pointing, phased array antenna system with no moving parts. Such antennas would operate seamlessly over traditional GEO satellites, HTS GEO Satellites as well as Non-GEO (LEO/MEO) satellites. The potential for this ‘holy grail’ of antenna design is significant. From easy installation on any moving vessel, be it land-mobile, marine or aeronautical, to wearables like helmets and backpacks, these low-cost terminals have the potential to forever change satellite communications for both military and commercial applications. 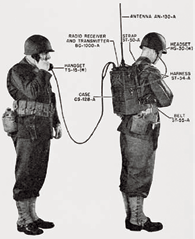 Battlefield communications used to be extremely limited and unreliable. In today’s connected warrior environment, the operator is more accessible to his peers and surrounding environment than ever before, thanks to smart radios, video links, drones, SATCOM, and much more. Having the most reliable and advanced equipment available, at a reasonable price, is going to keep soldiers safer and ensure critical mission success. The critical importance of stable, robust and ‘always-on’ communications for soldiers, border security forces, and any remote vertical, continues to grow. 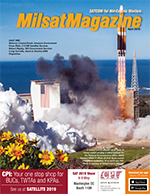 Military comms via satellite (MILSATCOM) can be extremely complex, expensive, and unreliable. Add to this the challenge of portability, robustness and pointing accuracy, and it appears that keeping soldiers connected is no easy feat. Drew leads the sales and marketing departments at C-COM and directs the promotion of the iNetVu® mobile antenna, the world’s premier auto-deploy and fully motorized VSAT solution. His team works to promote global sales via C-COM’s worldwide dealer network as the company seeks to partner with new resellers to sell & support the iNetVu® product. Drew holds a Bachelor of Honours Science degree from the University of Waterloo and brings to C-COM extensive sales and marketing skills acquired through the management and ownership of a commodity brokerage firm in Los Angeles. C-COM Satellite Systems is a world leader in commercial grade mobile, motorized, auto-pointing satellite antennas, with a C-COM’s product line that is a focused Commercial-off-the Shelf (COTS) antenna system.